After a full month's field-trial (with real customers acting as their unpaid testers), Nokia has decided they were right the first time: Skype won't run properly on Tango-level Windows Phone devices. Some users reportd a 'low system RAM' warning after installing Microsoft's VOIP app, while others complained of laggy performance. 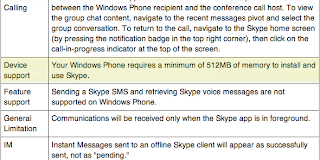 In April, when Microsoft first released Skype v1.0 ('Gold Version') for their Windows Phone platform, the app came with two caveats: (1) It couldn't be used without a front-facing camera; (2) It wasn't intended for low-RAM phones. 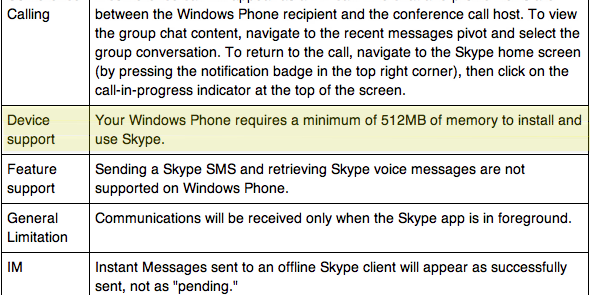 In fact, Skype has always specified 512MB RAM as the minimum requirement...no exceptions for Nokia. 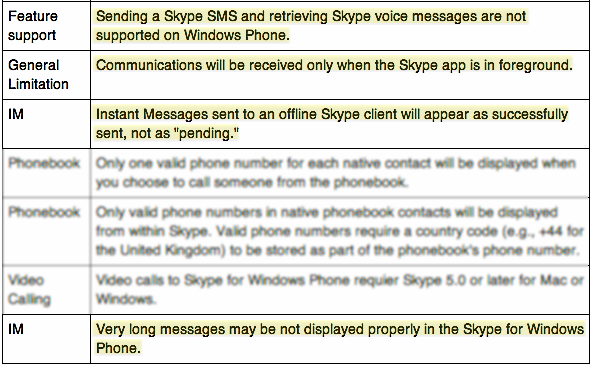 Two days later Skype seemingly reversed this decision, if only for a single model: Nokia's Lumia 610. Introduced at MWC, the 610 was promoted as Nokia's 'Android Killer' for the low-end smartphone segment and hailed as the first Windows Phone built to the new 'Tango' specs, which dropped minimum RAM to 256MB. You might think this made the 610 a poor candidate for Skype. So how did Nokia get around the RAM shortage? Rumor has it, they built and installed a custom version -- 'Skype Gold Lite', if you will. This was further surgery on a battered application; Skype's features had already been reduced in going from desktop to mobile. Skype lost something in translation to Windows Phone..
Now, after all that cutting, we're told the patient didn't survive. Nokia attaches great importance to the launch of products and services to bring the user experience, so even if the Skype Windows Phone version on the Nokia Lumia 610 does, but after intensive testing, we found the user experience does not guarantee to Nokia and Skype the expected level. Therefore, we do not recommend users to use Skype on the Nokia Lumia 610.Nokia Lumia 610 users in the Windows Phone Marketplace "will not be able to download Skype, Windows Phone version. Skype, Windows Phone version will continue to open to other users to download. To be fair, Nokia had warned us about this possibility. If you whip out your copy of the Lumia 610 user guide and go straight to the 'About' page, you are presented with a rather broad disclaimer about applications being 'limited'. And since Microsoft has lawyers to spare. you'll find a similarly open-ended disclaimer at the Windows Phone site, under 'Features and Service Availability'. So, 610 users can forget about RAM-hungry animated games, like Angry Birds or Plants vs Zombies. But likely incompatibilities go beyond a mere shortage of system memory. 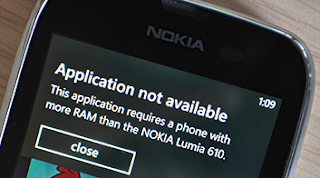 Some apps can't be installed because they rely on features not present on the 610. For example, Pac-Man Kart Rally won't run on phones with no integral compass. 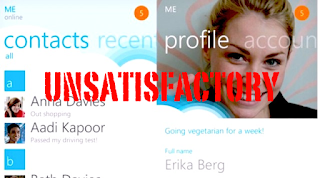 In fact, while Microsoft claims Tango is compatible with 95% of Windows Phone apps, some reviewers suggest the problems go deeper, especially with the most popular WP apps...and Skype would seem to qualify, on both counts. 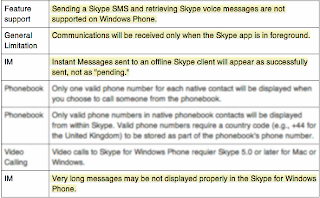 If Nokia knew full well that Lumia 610 was a marginal Skype device, then why release it without thorough testing? SImple: Because Nokia and Microsoft need Skype on WP's Tango phones. Android is destroying Nokia in the budget smartphone category, especially among first-time buyers. Corners were cut on the 610 because it was built to a price. But if Nokia could still manage to squeeze in Skype's free VOIP calls, that would be a powerful selling-point for the 610 and, even more importantly, for all upcoming Tango models. Today's news represents a big setback, for both companies.